The Theme for the competition is Gustav Klimt’s iconic painting The Kiss. The entries will be judged and the finalists announced at the Art and Framing Awards in Stratford Upon Avon in May. Nicole commented “My entry is a Klimt/Lindt Chocolate Box Selection designed to be a free standing piece in order to represent a box of chocolates. Framed to budget level due to the wide selection of materials involved in both its construction, contents and the polyester film used for glazing to create the chocolate box look. A gold moulding was used and cut on its side to create the chocolate box. Inserted into this was a plastic biscuit tray sprayed gold and decorated with pieces from a printed copy of “The Kiss”. 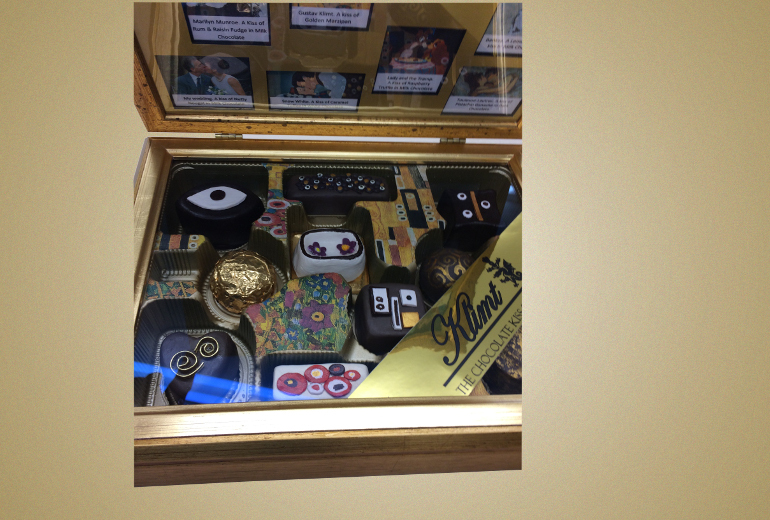 The chocolates were handmade made from air dry clay and painted in a Klimt style. Silicon was used to stick them in. 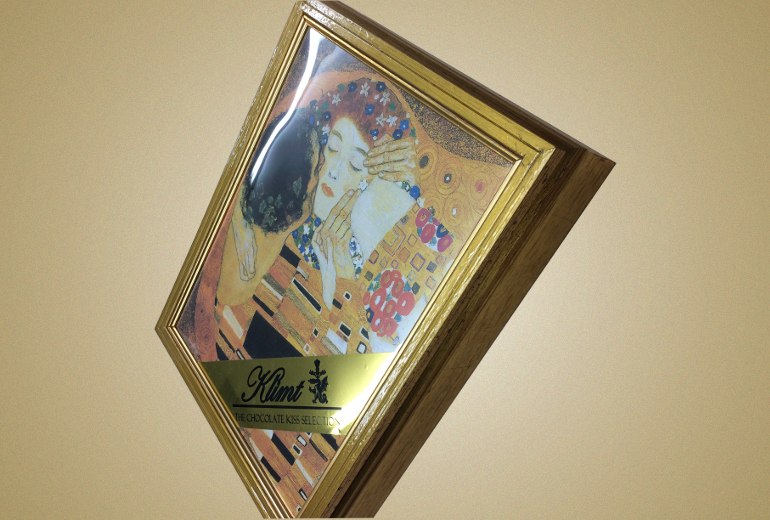 Ultra vue glass was chosen so as to appear invisible and to carry the printed gold foil glass transfer that I designed of the Klimt/Lindt logo applied. This is held in place with a trimmed gold slip to create the edge of the box. The chocolate box lid is double-sided, hinged and made from a waste piece of moulding. It contains on one side (the top) a printed cropped version of “The kiss” glazed with polyester film to create the chocolate box look. This is held in place with pieces of trimmed gold slip. 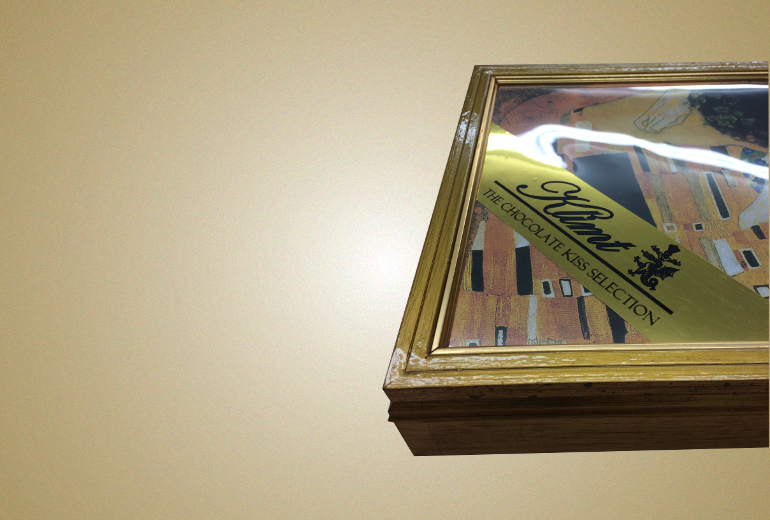 A gold foil Klimt logo sticker which I designed was added across the corner. On the reverse (inside) it holds a gold/black core multiple hand-cut mount. This displays 10 different famous kisses from the world of art, film, history, religion and royalty and of course Klimt “The Kiss”. 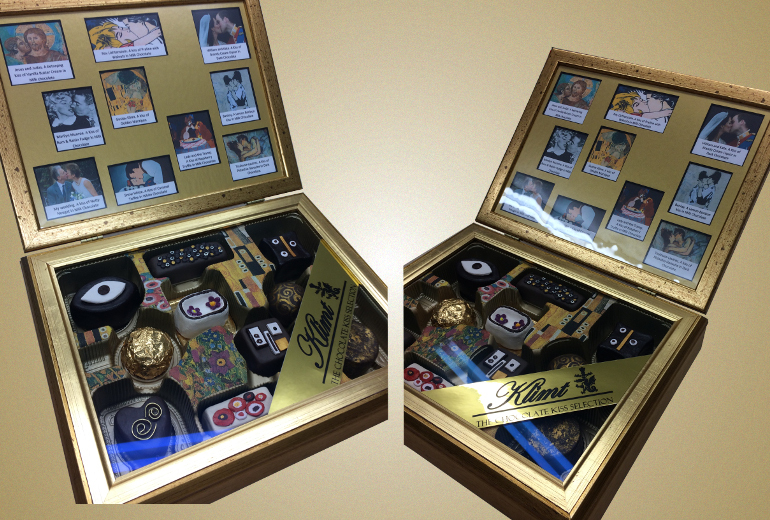 Each kiss represents one of the chocolates below in the box playing on the Klimt/Lindt connection”.